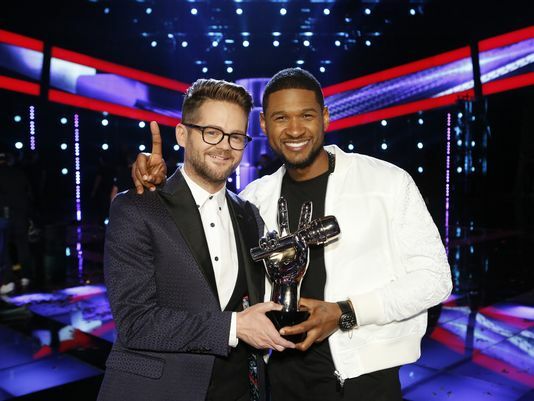 ‘The Voice’ winner Josh Kaufman, left, and his coach, Usher, strike a triumphant pose after Tuesday’s finale. I am personally not surprised that Josh Kaufman won the Voice this season. His vocal range and performances really grabbed America. It also marked the first time that another coach besides Blake Shelton and Adam Levine had the honor of having the winner in his team. Usher broke that streak. Usher’s unique almost sports-like quality to his coaching style also has stood out along with his passion for the artists. His feedback was always honest and forthright. It was coming from his experience as a music artist. He genuinely wanted to imbue his team members with the best kind of training. He also is competitive and was able to establish himself firmly in spite of the bromance rivalry between Shelton and Levine. He was able to also handle fellow coach, Shakira’s formidable challenges. In the final analysis, Josh Kaufman’s talent could not be contained and his star shone above the rest. His win was also established even with the iTunes’ glitch which kept his fans from purchasing his songs ( which translated to votes) during the final hours of voting. The purchases during the glitch did not go to the count and it was established that it did not impact the results of the vote. The Voice has performed strong in the ratings which speaks to the success of its unique format and the talent being showcased.